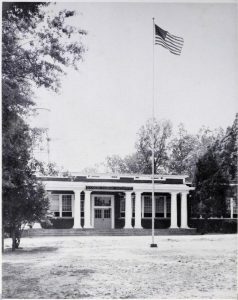 A new batch of yearbooks from Greensboro are now available on DigitalNC, courtesy of our partner, the University of North Carolina at Greensboro. Included in this collection are nearly 30 yearbooks from schools across Greensboro during the first half of the 20th century. While some yearbooks are more sporadic than others, this batch does include the 1907 Annual from Greensboro High School, making it one of the oldest high school yearbooks on our entire website! These yearbooks include individual portraits, class portraits, as well as photographs of activities, clubs, and sports. Some of the yearbooks also include notable events throughout the school year, poems dedicated to the classes, histories of the classes, and “class prophecies”, where the students imagined where they would be in the future. One of the most notable events found in these yearbooks is in the 1924 Reflector from Greensboro High School. 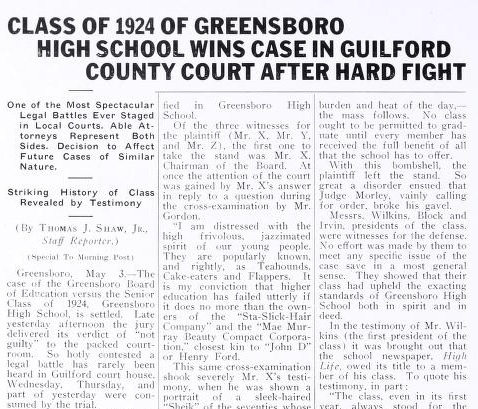 In May of 1924, the senior class was actually sued by the Greensboro Board of Education, alleging that the class members had forfeited their right to graduate by reason that they had failed to maintain the high standards associated with the school. When one plaintiff was called to the stand, he said that he was “distressed with the high frivolous, jazzimated spirit of our young people. They are popularly known…as Teahounds, Cake-Eaters, and Flappers.” The jury delivered a verdict of “not guilty” to cheering and applause in the courtroom. To see more from our partner who provided these yearbooks, visit UNCG’s partner page, or take a look at their website.